I’m excited that I finally get to post this article! The work was done at the same time I was making the Batwoman and Green Lantern costumes but I’ve had delays finishing it. Anytime my articles are picture intensive it takes me a lot longer to get them ready to post. Melanie and I have had our current Bibles for at least 15 years and they were really starting to show their age. We had taken years of notes in them from church lessons and BSF (the best Bible study we’ve ever been in – free and available worldwide) so we were reluctant to replace them. I knew that recovering a Bible is more expensive than buying a new one. Based on prices I found online I knew that I would want to try doing it myself before I turned it over to someone else. Some of you may wonder why I didn’t go with a quicker and easier solution. I knew we didn’t want to get one of those zippered sleeves. What a hassle! I don’t like the way they look either. I’ve tried using an iPad, a smartphone, and websites like www.biblegateway.com. They are great secondary references but I always come back to reading the printed word as my first choice. I even notice a difference reading Melanie’s Bible so it’s really reading my printed Bible that I prefer. It also gave me the opportunity to choose a durable and beautiful leather in the finish that I wanted and customize the look to my specs. Most of all, it seemed like something fun and useful to do. All of the Bibles I’ve seen come in one of two basic styles of page attachment: glued in place or stitched in place. I know it gets much more detailed than this but anything I’ve read or experienced with my own books tells me that glued pages just are not going to last if you use your Bible regularly. Unless you really want to keep that Bible, I don’t know if the work and expense of recovering is worthwhile on a glued-page version. It is pretty easy to tell if your pages are stitched in. 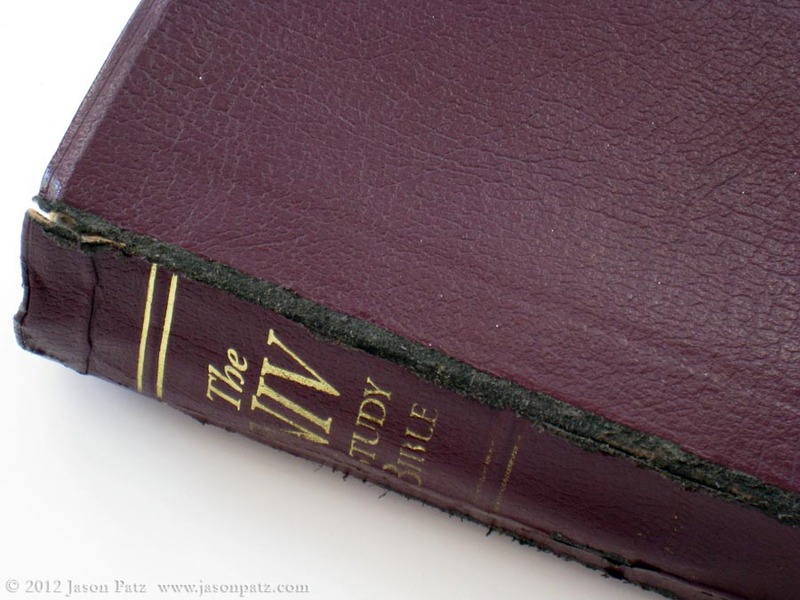 Simply open the Bible and carefully inspect the area where the pages attach to the spine. You should see some tiny threads going through from one page to the next. On our Bibles this is not obvious on every page so you may have to try looking at several different pages. 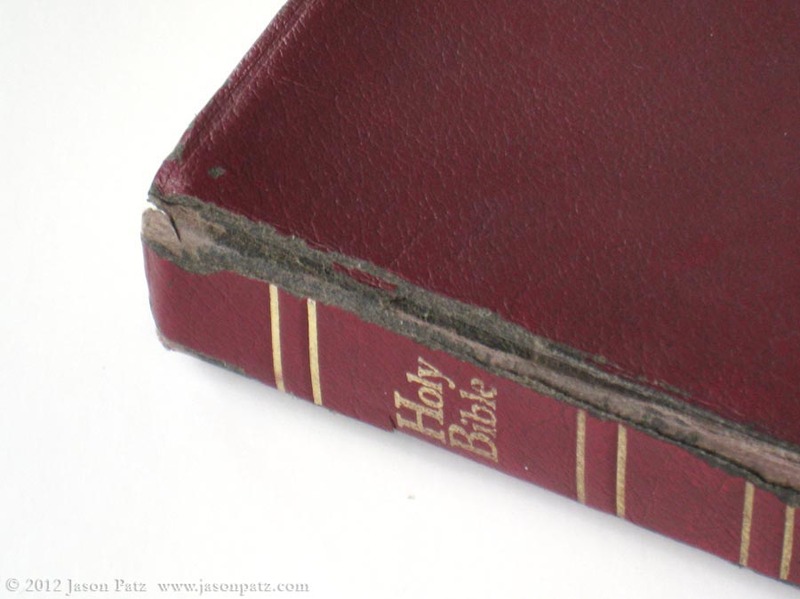 A NOTE ABOUT REBINDING: This is a guide on recovering a Bible not rebinding one. Recovering is replacing the cover. Rebinding is reattaching pages that have come loose. You can find all kinds of guides on rebinding books online and at your library. Never having rebound a book, I don’t know how likely it is that you will make the book hard to open or hard to read if you do that work incorrectly. If you are at the point of replacing your stitched-page Bible, why not experiment with rebinding first in case you can save it? PVA glue – Elmer’s, Sobo, Aleene’s, etc. Glue spreader – popsicle sticks, cardboard, etc. 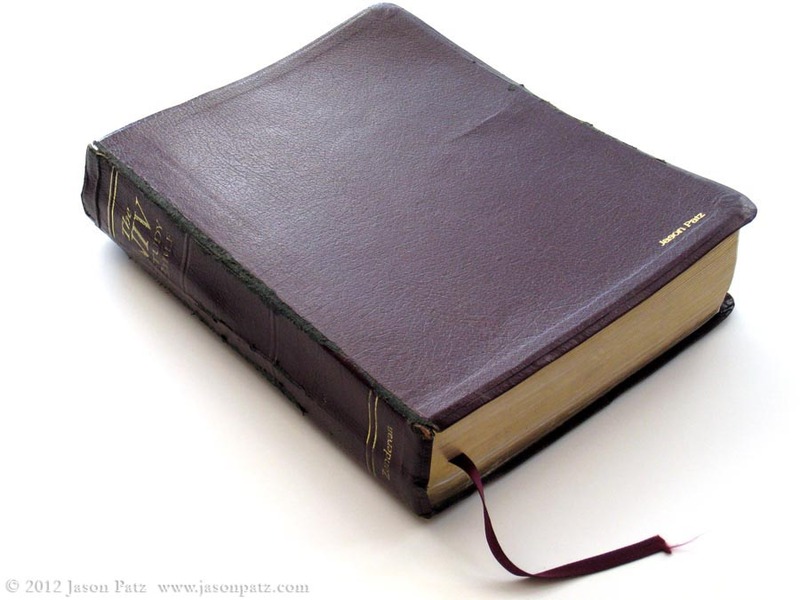 A Bible is made up of three basic components: the text block (all the groups of pages joined together in one unit), the endpapers (that join the text block to the cover), and the cover. Most (all?) of the time there is a strip of thin cloth that runs from the spine of the text block to the endpaper and cover to help strengthen the connection of the text block to the cover. Open the Bible so one of the endpapers is lying flat and record its dimensions. You’ll use these to make new endpapers later. Measure how much the cover overhangs the text block. You’ll use this information when attaching the new cover later. Cut the endpapers to free the text block from the cover. Try to do it without destroying the cloth strip on the spine otherwise you’ll have to replace this part too. Melanie’s Bible with Endpapers Cut Off to Remove Cover. Though Hard to see, the Cloth Strip is Intact. For my Bible I attempted to peel the cover off the endpapers. It took a while and I ended up tearing the endpaper. For Melanie’s Bible, I just cut it free as detailed above. The leather may change shape and shrink a little so it is important to do this step now before you cut it to size. Test your sealant on a scrap first to make sure it doesn’t adversely react with the finish or discolor the leather in an objectionable way. 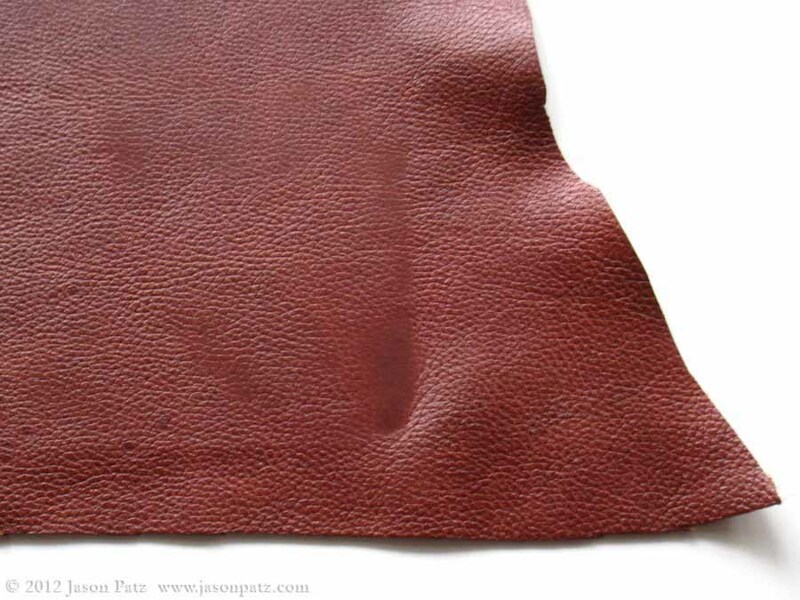 Next, apply the sealant to the leather following the manufacturer’s instructions and let it dry completely. For the sealant I used, I squirted a paper towel liberally, wiped it on the leather, wiped off the excess, and let it sit overnight. It may have made the leather slightly more glossy but it did not affect the feel of it. Very Smooth and Soft. Note the Scar. 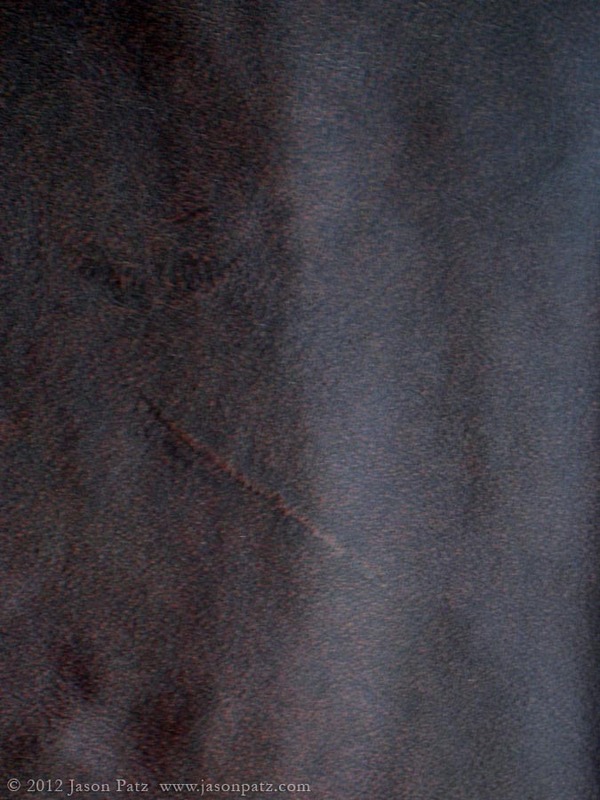 This Leather is Heavily Textured. Not as Soft. Shows Scratches (I Want it to Look Used). GENUINE VS. BONDED – If you read nothing else about leather, read this: DO NOT USE BONDED LEATHER EVER. It is the equivalent of particle board. Leather bits are ground up and glued together. 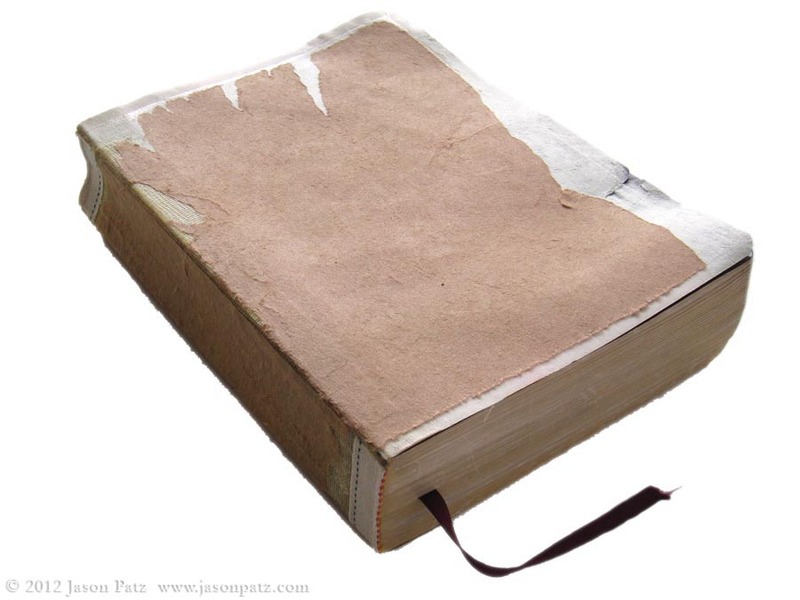 This is probably what was used on your original Bible cover and is the reason it is falling apart now. 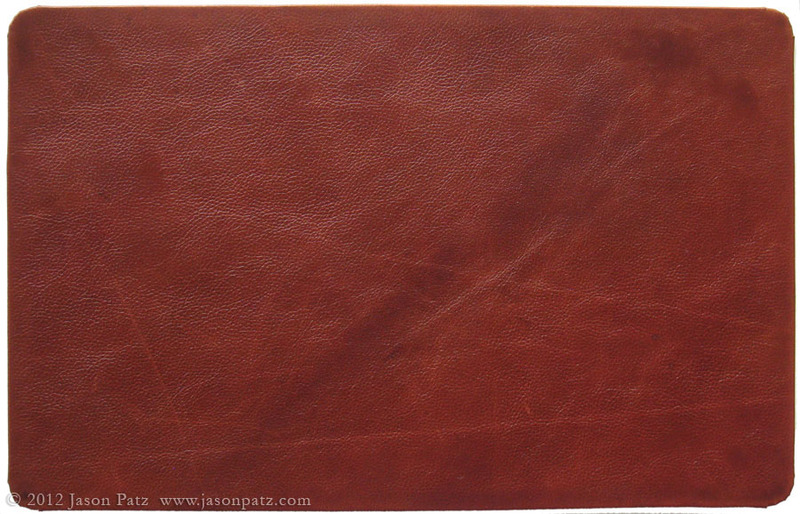 GRAIN – There is a lot of information on leather grain available online and not all of it is in agreement. I’m not an expert but from what I’ve been able to learn, you want either a full grain or top grain leather. It seems that everyone agrees that full grain is the strongest and longest lasting. It may be that it cannot be found thin enough to be used for a book cover. Top grain has had at least some of its imperfections sanded out and has been split to make it thinner than full grain. Bottom line: Be sure to see the leather in person before buying it. Touch it, try to scratch it, crumple it, pull it. As long as it seems good and is either full or top grain you should be just fine, but full grain is better leather. WEIGHT – Refers to the thickness of the hide. I won’t get into how many ounces you want and all that. Basically you need to find something that bends easily and is thin enough to be folded over on itself for the edge of the cover. The stuff I used I’m told is pretty thick for book binding (~1/16” thick) but it worked great. 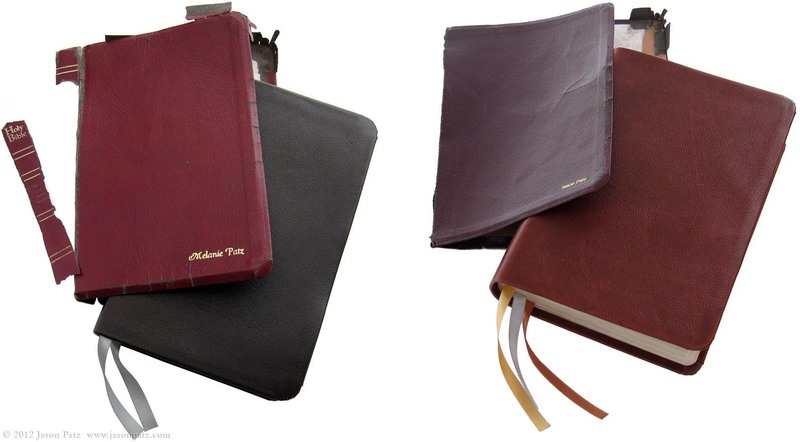 Cowhide – Durable, affordable, loaded with character and texture – This is what I picked for my Bibles. 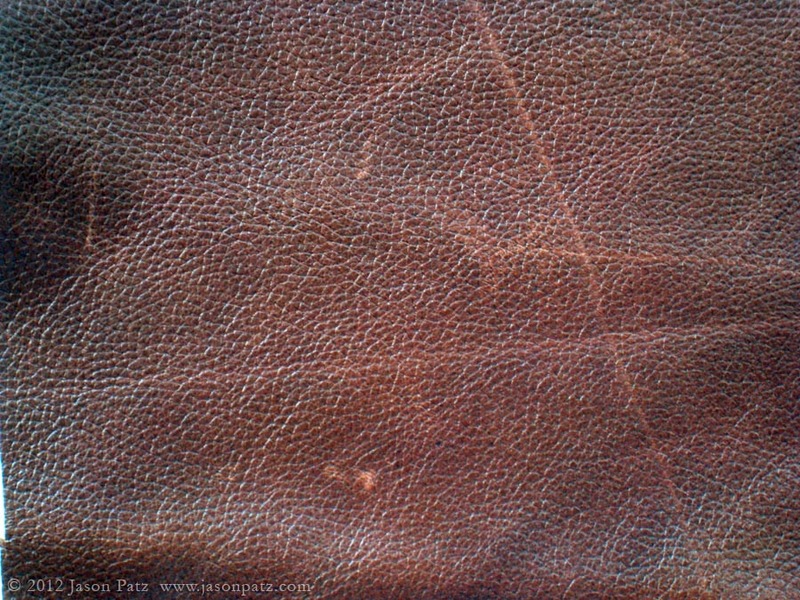 Pigskin – soft, almost as durable as cow and super thin – Apparently this is the most used leather for book covers. 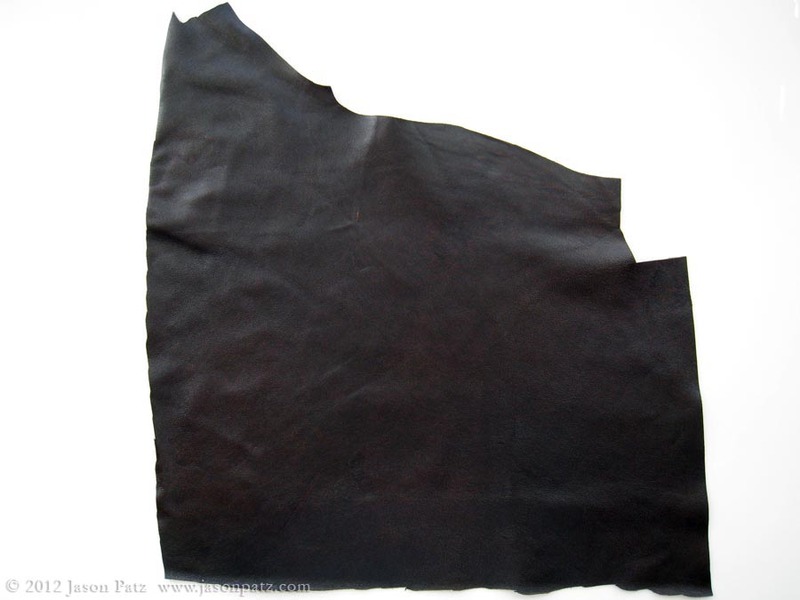 Lambskin – almost as durable as cow and soft as butter – If I could have found an affordable piece of this, it is what I would have used. A delight to touch. Kangaroo – super thin, smooth, kind of stiff, ultra strong, expensive – Supposedly the highest tensile strength of any leather. They make whips out of it. I tried to tear a sample of it about the thickness of a piece of paper and it just laughed at me. Tandy Leather – They have any type or finish but they are expensive because you are literally buying a cow’s worth of leather. Check their remnant section though. Upholstery Shop – Check for remnants. Thrift Stores – The absolute cheapest and possibly highest quality. If you can find an old backpack, leather jacket, or purse, you may have something beautiful, soft and super durable for almost nothing. I found a large purse that almost worked (it had pockets that I didn’t want). It would have been enough leather for both Bibles and it was only $2.00! HOW MUCH DO I NEED? 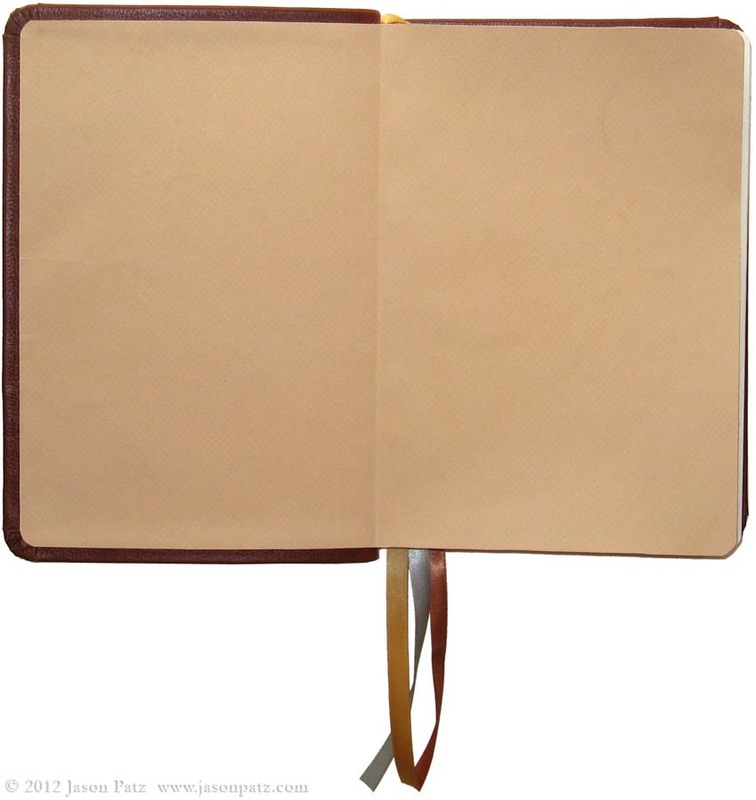 Open your Bible flat and take note of the cover’s overall dimensions. Get a piece that is at least 2” larger in both dimensions (1” overhang on each side of the existing cover). 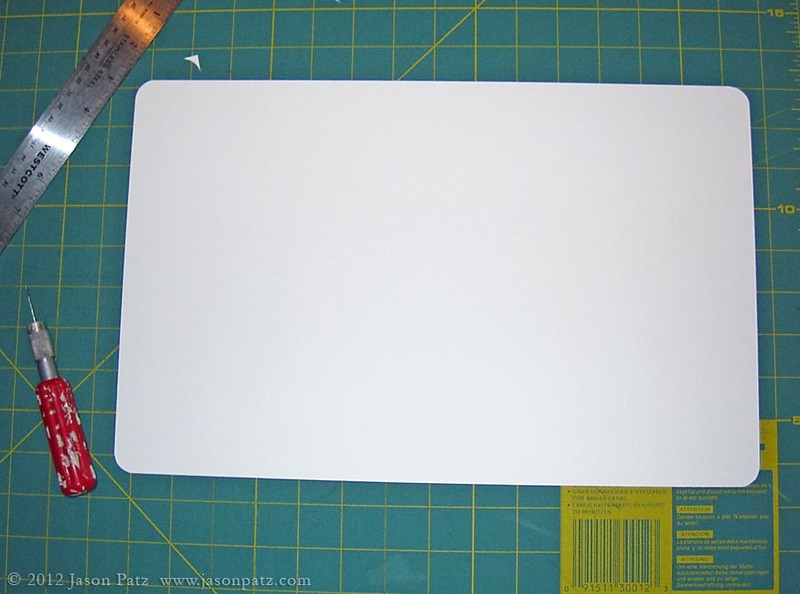 Using the existing cover as a guide, lay out a new backer board for the Bible and cut it out. Take note of the thickness of your old cover and the thickness of the material you plan to use for the new cover. Adjust the dimensions accordingly. 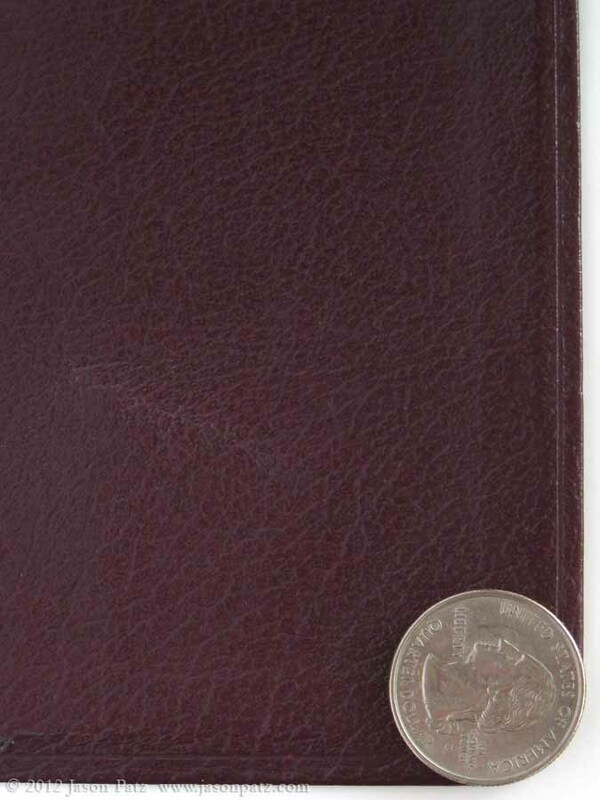 For example, the new leather I used for both of the Bibles I recovered was substantially thicker than their original covers so I decreased the dimensions of the backer board by 1/16” inch so that the new covers would have the same finished dimensions as the originals. The Corner Radius is the Same as a Quarter so I used that as a Guide. 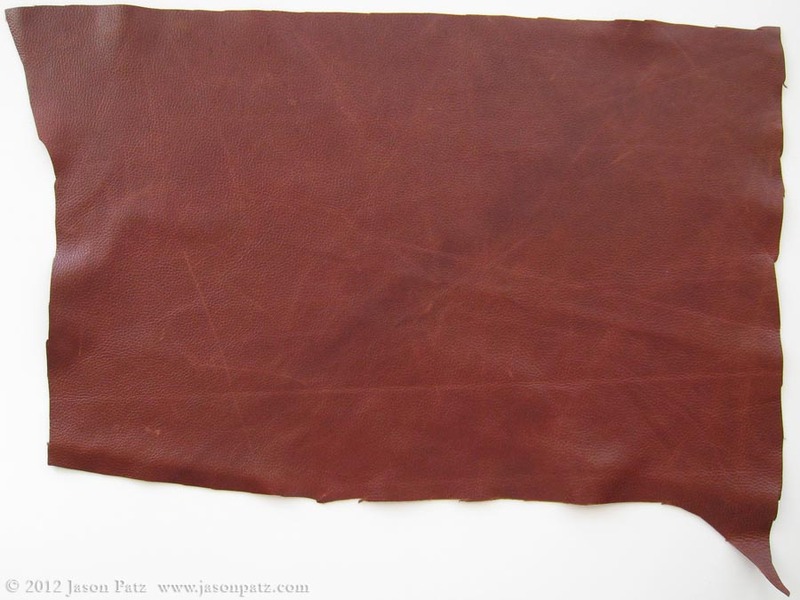 Place the backer board on the front side of the leather and determine what part of the leather will make the best looking cover. Should that brand be centered? If you shift it a little will you be able to cut off that scar? NOTE: Be sure to have at least ½” of leather overhanging each side of the backer board, but an inch would be even better. Prepare a clamping station by laying out two pieces of smooth flat wood slightly larger than the size of the cover. Lay a piece of wax paper on each. Place the leather face down on one of the pieces of wax paper. Open the clamps so they are ready to use. Working quickly, coat one side of the backer board with PVA glue and press the backer board on the backside of the leather. I found that using a scrap of the backer board as a paddle made spreading an even coat much easier. The glue skins over quickly so work fast. A NOTE ABOUT PVA GLUE: PVA glue comes in many brands and varies wildly in quality. Elmer’s glue, that you probably used in grade school, is the thinnest and most likely to make pages wavy due to all the water in it. Aleene’s and Sobo are much thicker. I’ve used both on many architectural models and prefer Sobo. They both are incredibly strong but are probably not as easy to spread as you’d like for bookbinding. I recommend getting the PVA glue made specifically for book binding (pictured above). 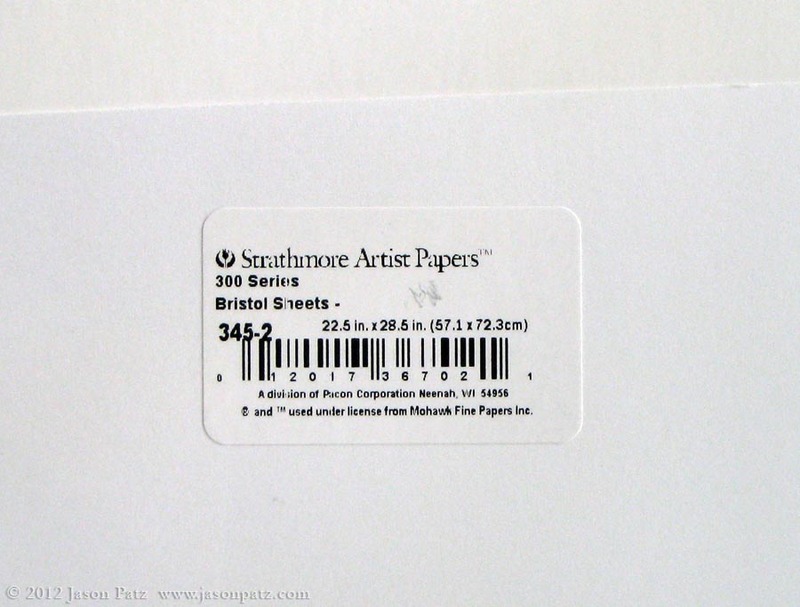 It isn’t super expensive and is available online and at art supply stores. Wipe off any glue squeeze out. Lay remaining piece of wax paper on top of backer board then remaining piece of wood. Clamp pieces of wood together. Be sure to clamp lightly. You only need enough force to flatten everything out. Too much pressure will crush the grain. Let the cover cure overnight. I over-clamped this corner. Sometimes shapes/depressions can be pressed into leather but they will rise back/heal over time. In this case, I think the depressions I made are permanent. It has been three months and they have not disappeared. Cut both pieces of endpaper to match the size of the originals. Melanie’s Endpapers. Care was Taken to Center the Dots Vertically and Horizontally. I wish I could have gotten a smoother paper for mine (easier to keep clean) but my Bible is large enough that art paper was the only thing that I could find big enough. 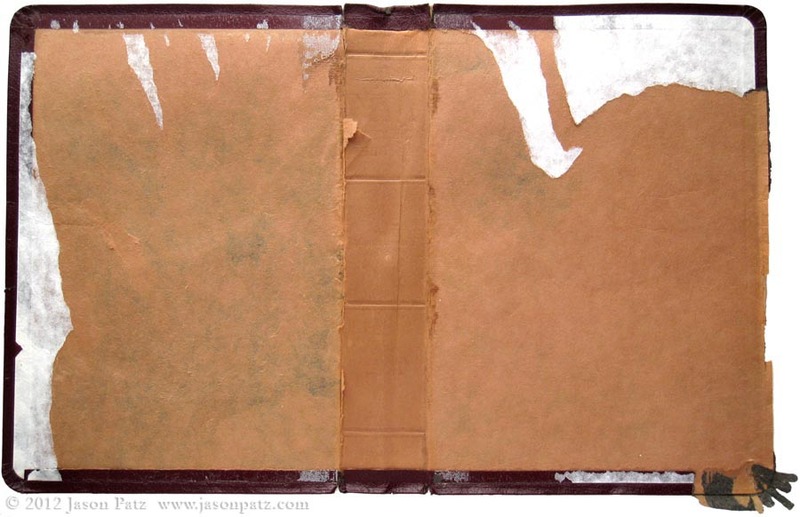 Place a layer of wax paper between the text block and endpaper on both sides of the Bible. If the cloth strip on the spine is still in good shape, you can simply glue the new endpapers to the text block and to the cloth strip the way the originals were attached. If not, you’ll need to use a new strip of cloth that is glued to the spine and overlaps about an inch onto the back of the endpapers. For my Bible I saved the old endpapers and glued in new ones to cover the old ones. I wouldn’t do it this way again. 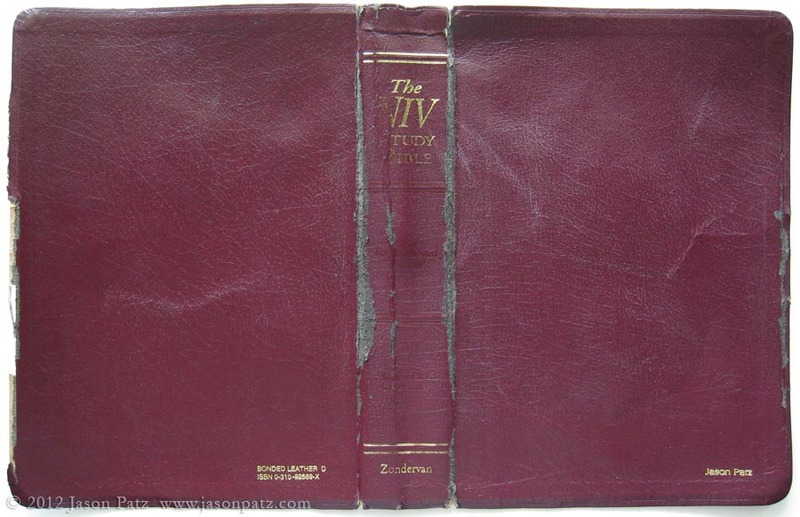 For Melanie’s Bible, the cloth and some of the glue on the spine was in bad shape but usable. I took three strips of about 1” ribbon and glued them over the cloth strip to strengthen the connection of the spine to the end papers. Once everything is glued up, place the Bible spine down on a smooth flat surface that has a layer of wax paper. The weight of the Bible will be enough pressure on the spine. Open the endpapers and place several heavy books on top of them to provide pressure on the cloth and optional ribbon attachments that are now underneath the open endpapers. Unwrapping the corner of the old cover revealed its construction. This pattern worked well on both of our Bibles. 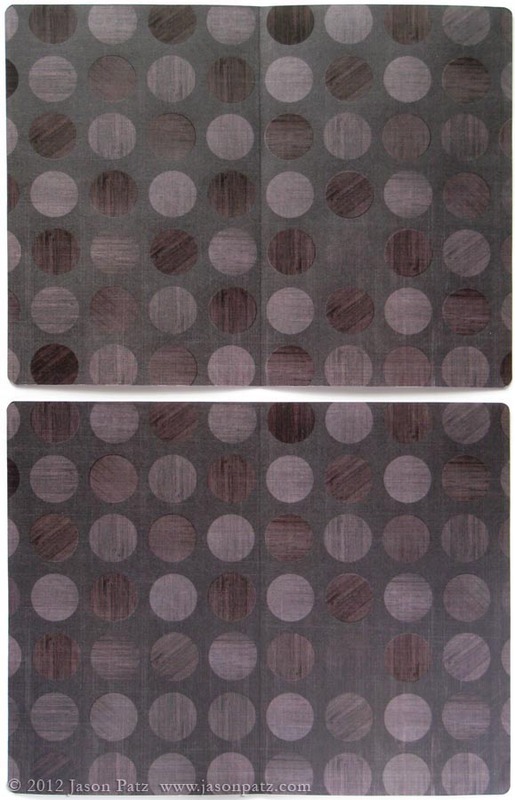 Use it to make your own pattern in paper or use the one off your existing cover. Next, cut off the excess leather leaving ½” on all sides. Then tape the corner pattern on each corner and cut it out. Get the clamping station set up with boards, wax paper and clamps just as you did in Step Six. Working quickly, glue each of the corners folding the flaps over onto the backer board in the correct order. Pinch them with fingers and hold until the glue grabs. Run a bead of glue along the backer board and cover seam. 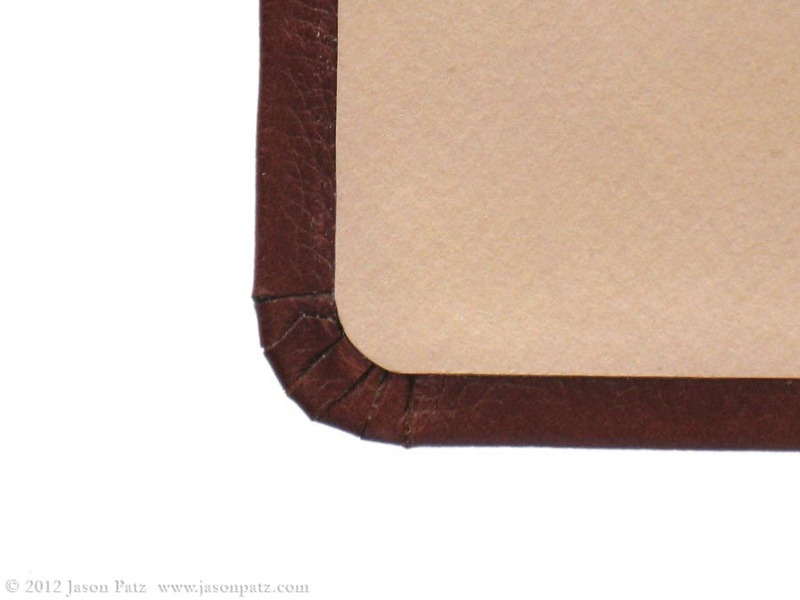 Spread the glue on the ½” leather flap with a paddle. Turn the leather over the edge of the backer board and press in place working from the middle out to the corners. 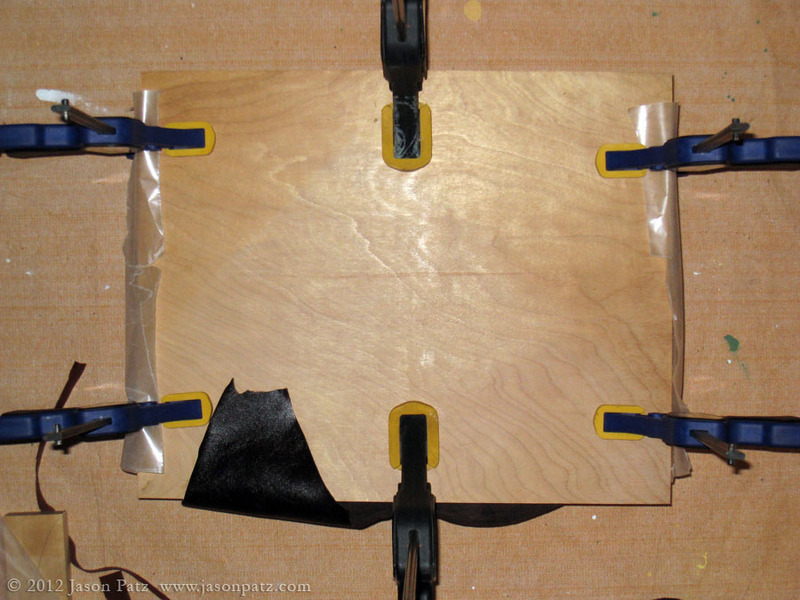 Place the cover in the clamping station between the boards and the wax paper and re-clamp as in Step Six. Once again, use the lightest pressure that will hold the piece flat or you may crush the leather. It is Nearly Impossible to get a Perfect Corner Every Time. Left: Smooth Transition. Right: Slightly Lumpy. It is useful to have an assistant for this step. Remove the cover from the clamping station and mark the amount of cover overhang from the edge of the cover on the inside/backside. You measured this dimension back in Step Three. These marks will allow you to align the endpapers so the cover overhangs the text block the proper amount. It seems that ¼” is the standard amount of cover overhang. Prepare the clamping station once again. Apply PVA glue with a paddle to the back of one of the endpapers. Line it up with the marks on one side of the cover and press it in place being very careful to smooth the paper as it is glued down. Do not glue the cover to the spine. Having someone else hold the text block is very helpful during this phase. Place the assembly in the clamping station with wax paper as before and clamp lightly. Let dry overnight. You will now repeat the process for the other side of the cover. Remove the cover/text block assembly from the clamping station. 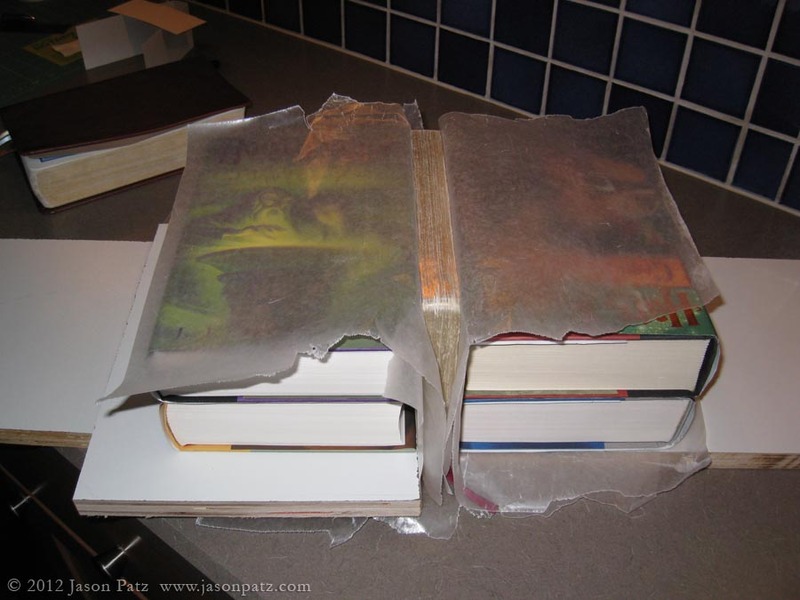 You will notice if you wrap the cover around the spine tightly and place the loose endpaper against the loose part of the cover that the cover appears to be too long. This is not a mistake. Both of our Bibles had 1/8” extra length of cover. This is what gives the spine of the cover its rounded edge. Prepare the clamping station and get an assistant if possible. Glue the endpaper to the other side of the cover lining up the ¼” marks with the edges of the endpaper just as you did before. The trick here is to make certain that the extra 1/8” of cover is pushed back into the spine area. Again, do not glue the cover to the spine. Place the Bible back in the clamping station using wax paper and lightly clamping as before. Let dry overnight. Remove your Bible from the clamping station. Read and enjoy. For our Bibles I chose to make removable bookmark ribbons so they would be color coordinated with the new covers and so we could mark more than one location. First, find a ribbon(s) you like. Make an insert from some of the scrap backer board (the one shown is made from endpaper but I later remade it from backer board). It should fit snugly in the gap between the spine and the cover. 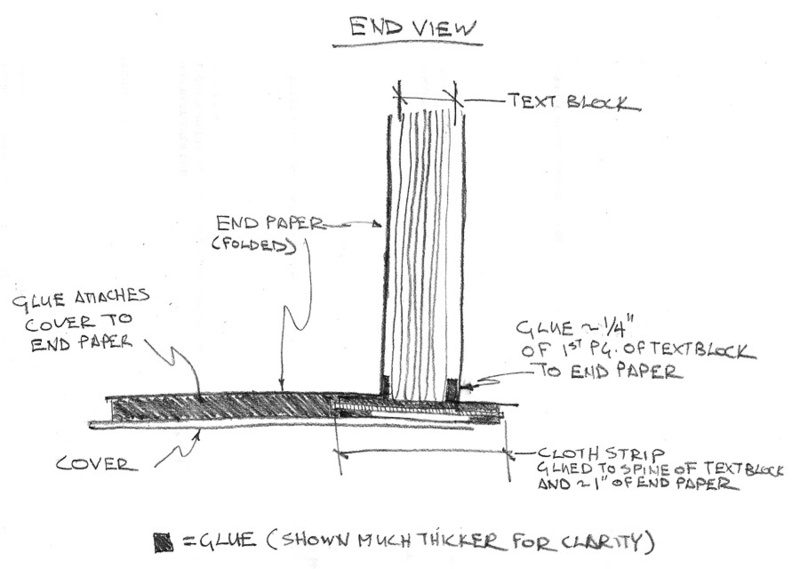 Make pairs of slits in the backer board wide enough for the ribbon to pass through. Loop the ribbon through those slits a couple of times and glue in place. Be sure to get glue on the cut end of the ribbon to prevent fraying. Let dry. 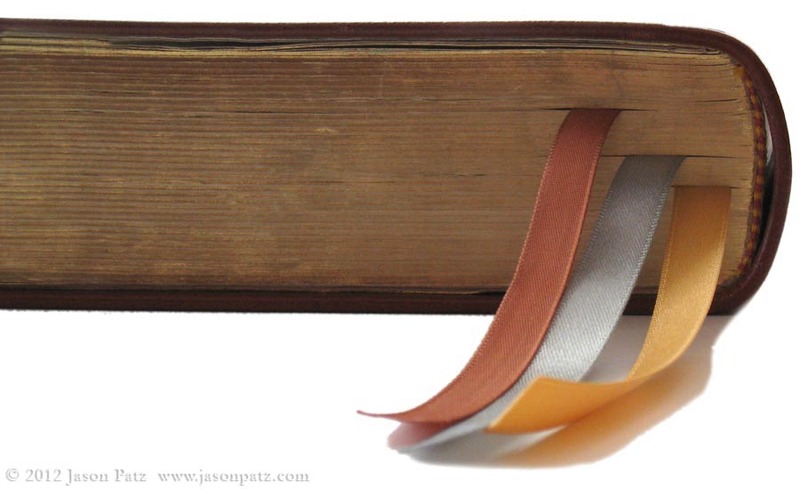 Slide the insert into the spine gap and run the ribbon through the pages of the Bible (as if it is marking a page). Determine how much extra ribbon you want extending from the bottom of the Bible (~3-4”) and cut the ribbon to length. Very carefully dip the ends of the ribbon in PVA glue and allow to dry. Now you have a set of bookmark ribbons that are fully functional yet removable should you want to replace or modify them. A year or two ago, my favorite bible went for it’s last ride on the top of the van on the way to church. I haven’t found its exact replacement for under about $80, but when I do, I’m going to give it a new skin. This is fantastic. Thanks for visiting my blog with your work. Great job. You’ve discovered some things I hadn’t considered. I have gone through several different covers, mainly for a chang-up for me…they were holding up fine. Finding leather Coach purses I can cut the gusset from and slip the bible into are my new favorite. I usually get a slip in pocket, and a way to secure the bible (the original purse closure). I just didn’t like how the last one gouged into my leg during church. 🙂 Great for travel, though! Fantastic walk-through! One question, why did you use a backer board? I haven’t seen this in other soft leather re-bindings. Does it detract from the natural flexible feel of the leather? 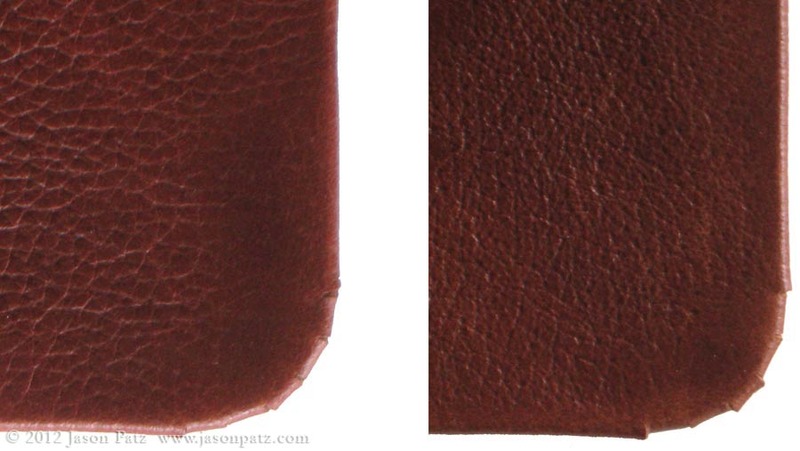 When I first envisioned our re-finished Bibles I was just going to get a really thick piece of leather and leave the edges raw (not wrap them over). There would be no backer board just the leather glued to the endpapers. I think this would have been a neat look and a nice feel. I couldn’t find leather quite thick enough for that so I wanted to be able to fold it over on the edge to have a finished edge (like a normal book cover). This meant I had the option to stiffen the cover if I wanted to. I really liked the feel of both of our original Bible covers and both Melanie’s and mine had a backerboard (you can see it in the pictures above where the old corner cover is unwrapped from it). It added just enough structure to keep the book from being a floppy mess (like a magazine) but allowed it to flex nicely. 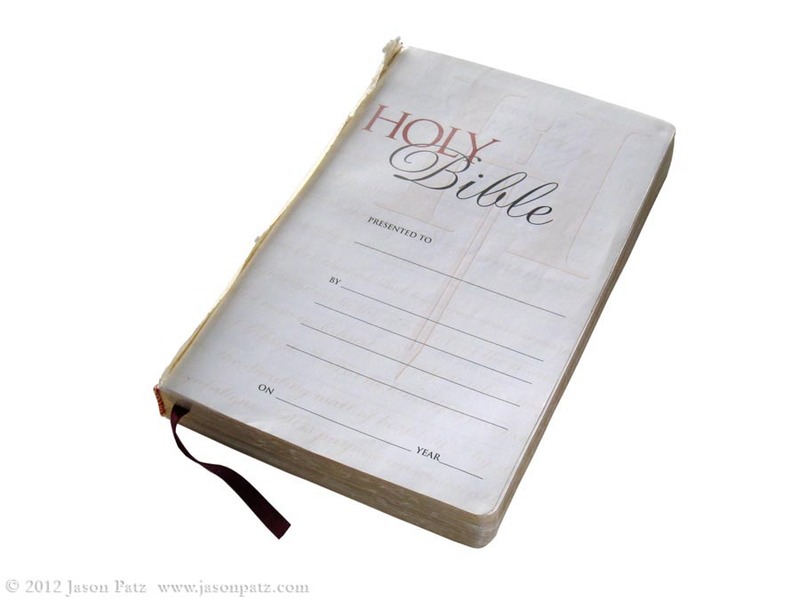 Of course you could go the other way with it and get really a really thick backerboard and make your Bible a hardcover. 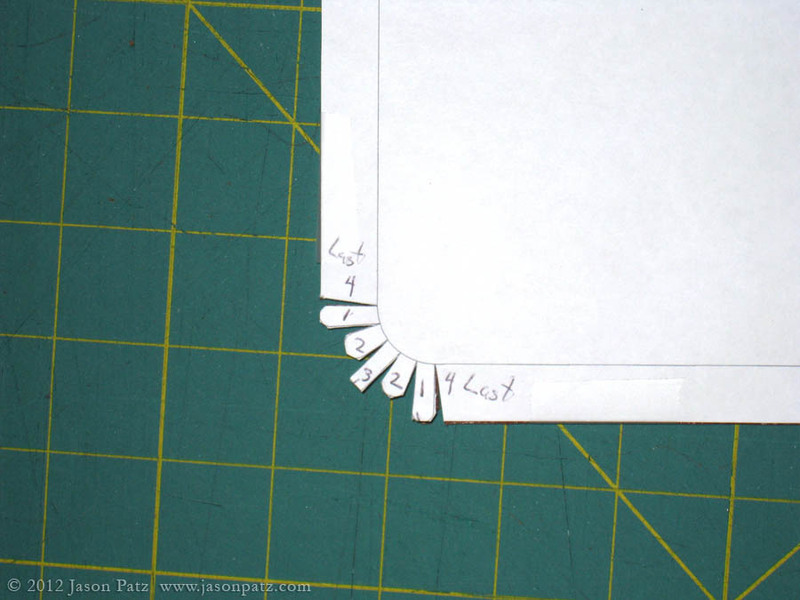 If you do this, you need to make the backer board in three sections instead of one piece – one for the spine and one for each cover with hinges in between. I’ll show a hardcover book I made with my niece in an upcoming post that will detail this. 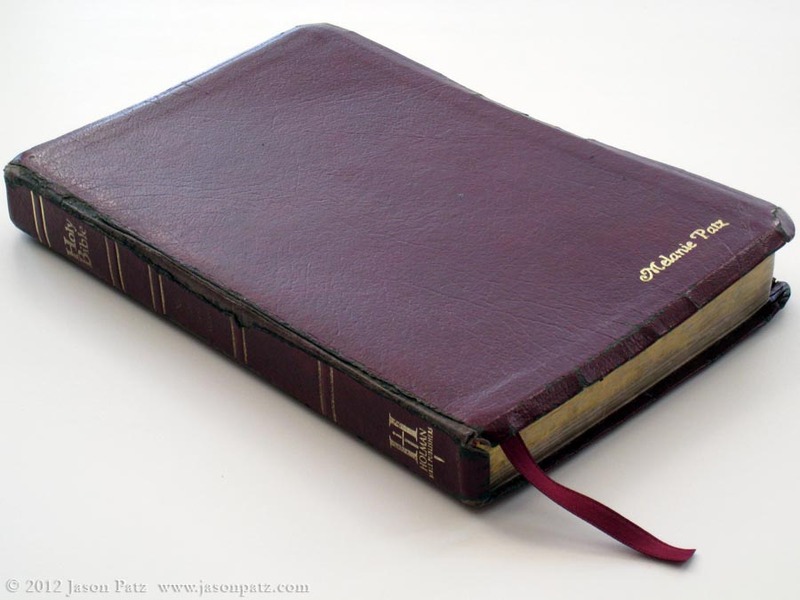 The bottom line is this: I wanted a certain feel for our Bibles – not too floppy or too stiff. 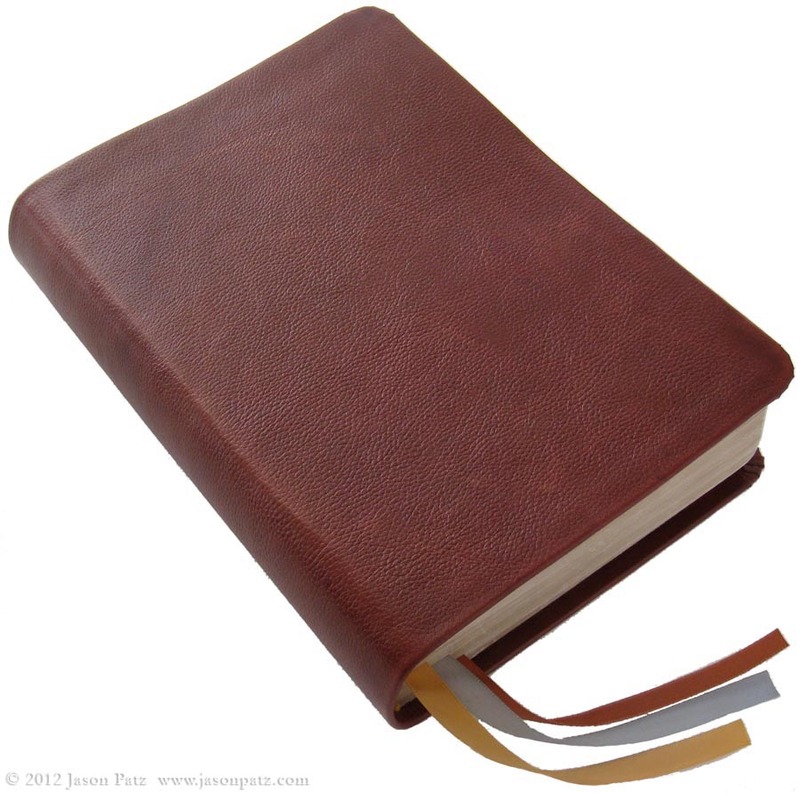 I bought the leather first and just wrapped it around the Bibles (uncut) to get a feel for how stiff the cover would be. Then I started playing with different thicknesses of stuff I could put behind the leather to get the feel I wanted. Please keep in mind, the backerboard I used is pretty malleable. You’ll notice in the finished pictures that the covers are bent and flexed in different directions. I like this quality. If you don’t, you can always get something a little stiffer that will retain its shape perfectly. Wonderful information, thank you very much!!! Could you post where you got your supplies? Glad to help. Be sure to let me know how your project turns out. All of this stuff is available online. I would want to see most of it in person if it were me though. I already had the clamps, Xacto knife and cutting mat. The leather was from a local place that was willing to sell me a remnant. I give several suggestions of places to look for that in the leather section above. The PVA bookbinder’s glue I got from a local specialty art supply store, but I know it is available through Amazon too. I got everything else from JoAnn Fabric and Craft and Michael’s. Thank you very much!!! I will keep you posted on how it goes once I tackle the project. I really like this! Thank you. The only thing I would like to do different is that I really like the “floppy” Bible feel. What would you suggest as an alternative the backer board? I think the backer board may be what you want. It is flexible. It isn’t like a standard hardcover book. I would think the only thing more flexible might be cloth or nothing at all. Is the backer board the same thing as “poster board”? Like the kind you buy in big sheets for school projects? 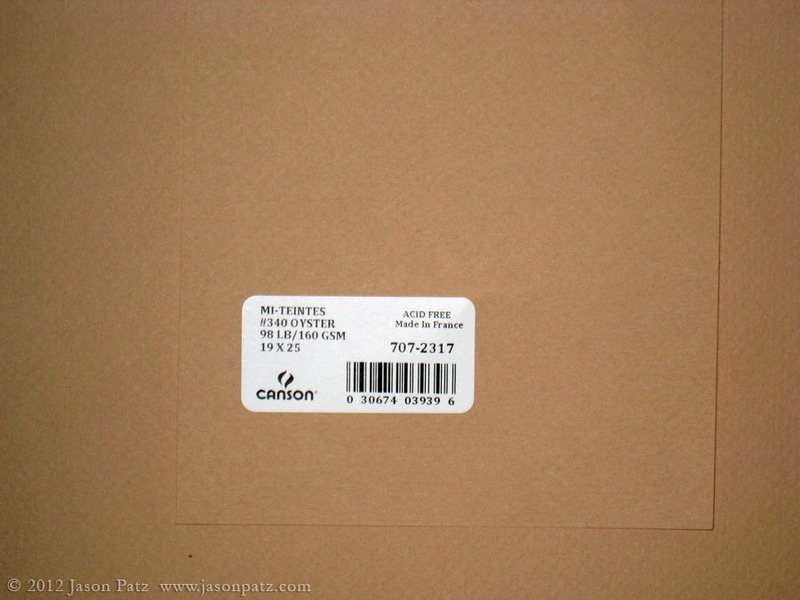 Hey Brandon, the stuff I used (see detail picture above for brand info) is a lot like poster board. You can read the comments above to see why I used what I used and how I determined what to use. I think you’d be able to do the same thing too. Hope that helps. Let me know how it turns out! I bought scraps from a guy. He didn’t know the weight. 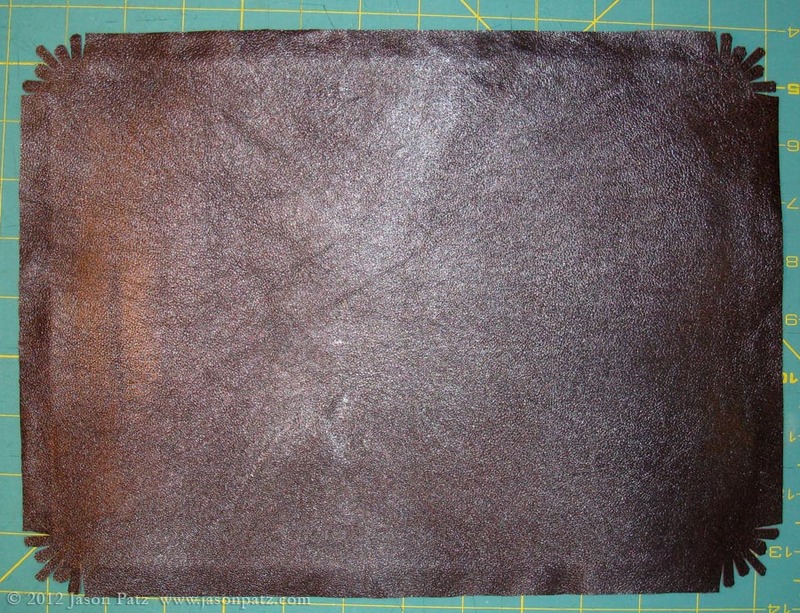 It is about 1/16″ thick cowhide. You can find information about the leather above in the section “Notes About Leather.” If you recover a book, be sure to tell me how it turns out and maybe link to a picture. Thanks so much for the tutorial. After reviewing I am still a little confused about how to attach the endnotes to both the text block and then to the actual cover. If there is some additional info you could add or pictures that would be great. I think I am most confused about how you attach the end papers to the cloth strip. Thanks in advanced. Working from the inside out you have the text block, the end papers, and then the cover. The end papers attach the text block to the cover. The cloth strip is glued on the spine of the text block and has about a 1″ overhang on each side that is sandwiched between the end paper and the cover. It is right where the pages of the text block and the end papers fold so they are reinforced by this cloth. I’m going to insert a sketch in step three of the article above. If all else fails, when you take apart your Bible to recover it, if you do it carefully, you’ll be able to see all of these pieces as the Bible is disassembled. Thanks for sharing this. I have some bibles that I have been wanting to repair for some time now. I do a lot of book binding but have never repaired so was curious how to go about it. Your instructions really help. Thanks. That makes me very happy. Send me a picture or link to one of your recovered masterpieces once you finish. Very nice work Michael! Thanks for the link. The recovered Bible looks great! Very nicely done. How did you manage to salvage the end papers without ripping them to shreds? Very carefully and slowly. The bible was already over 30 years old so the glue was not as strong so I think that helped also. I getting ready to replace the cover on a 50-year-old yearbook and a soft cover bible. Just curious how the Bibles are holding up with use? 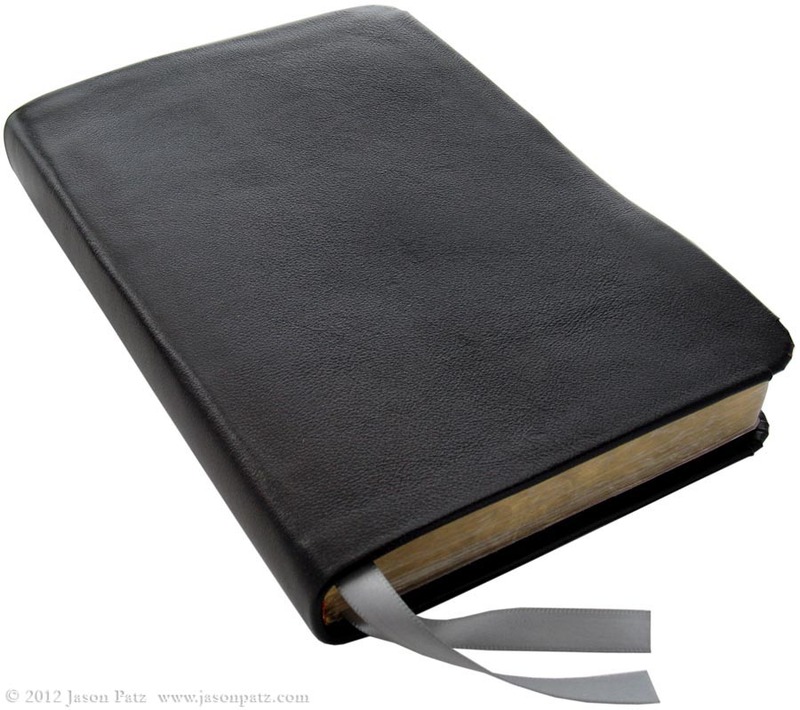 My bible was made with a leather that I knew would show scratches, which I wanted. Unfortunately, it is starting to completely wear through the finish in places now. Structurally, it is fine though. 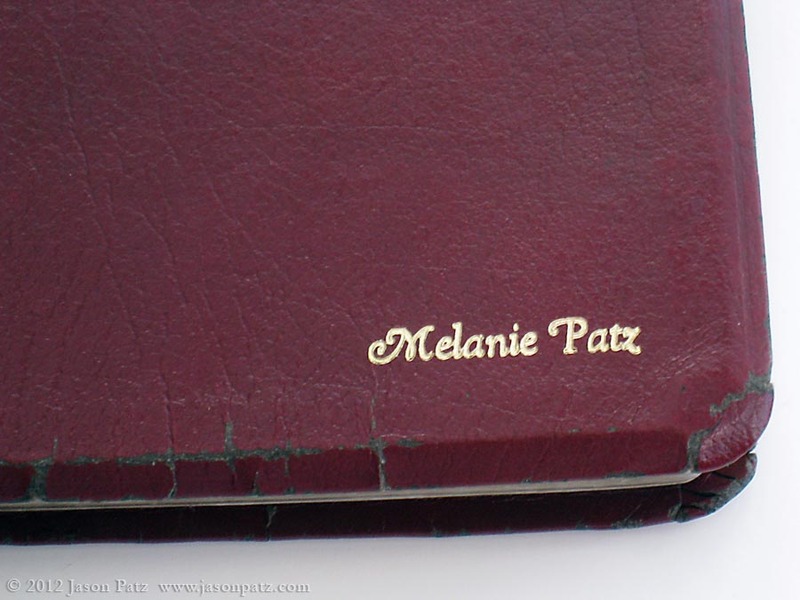 Melanie’s bible looks practically brand new. The leather looks great. The end papers show very slight wear. Overall, hers has proven to be extremely durable. Both of the leathers still feel really nice. Just wanted to thank you for your instructions on covering a bible. I have an old bible from my aunt published in 1950. It has beautiful pictures and is a pleasure to pick up and read except the cover was falling apart. Your website enabled me to recover successfully (pages were stitched together and still in tact). Now it is a beautiful book that we will enjoy for many years!! Your information was detailed, valuable and timeless! You just made my day Mary. Thanks for making the effort to leave a comment. I’m sure you could. I would test the fabric you plan to use with the glue you plan to use to see if it soaks through and discolors the fabric first. Thanks for the kind words too. Thanks for the kind words. I’m not doing work like that right now. I’ve seen work by AALeather.com and it is good. Check them out. Thank you I will do so.. have a wonderful day!! 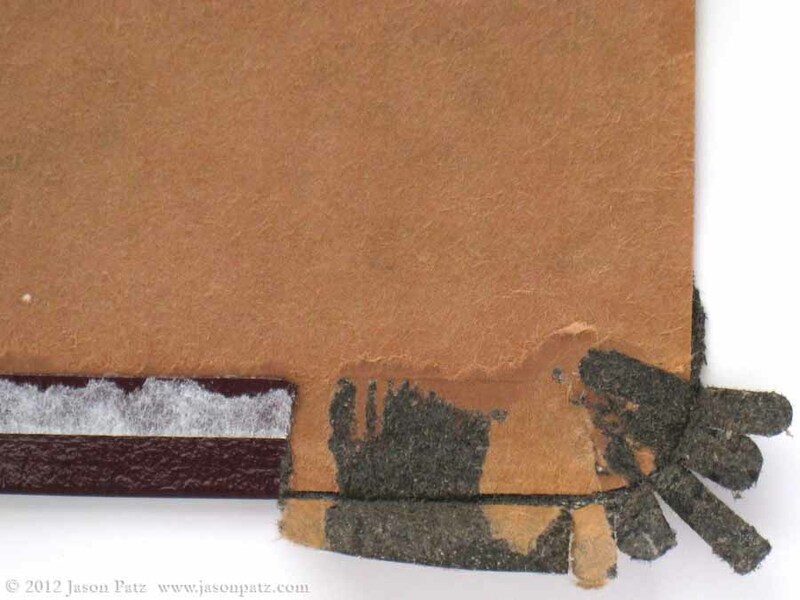 I’m in the process of recoving a bible with soft leather, using quality water colour paper for the backing. The original had soft porous card inside, but the owner wanted it a bit stiff. I’ve stalled because I’m scared! a) that the endpapers will stretch when pasted, but b) now you’ve suggested the leathermight also shrink! THe spray you suggest, would that just be applied to the inner glued surface, or both sides? Hi Belinda. I just put the leather spray on the outside. I wanted to make sure that nothing would interfere with the glue on the inside. If you have real reluctance and you have to get yours right the first time you could try recovering scraps or an old book first to practice.